7z is no doubt a feature-rich and powerful archiver (claimed to offer the highest compression ratio). Here at HowtoForge, we have already discussed how you can install and use it. But the discussion was limited to basic features that you can access using the 'function letters' the tool provides. Expanding our coverage on the tool, here in this tutorial, we will be discussing some of the 'switches' 7z offers. But before we proceed, it's worth sharing that all the instructions and commands mentioned in this tutorial have been tested on Ubuntu 16.04 LTS. Note: We will be using the files displayed in the following screenshot for performing various operations using 7zip. The 7z tool allows you selectively include files in an archive. This feature can be accessed using the -i switch. In the above screenshot, you can see that only ‘testfile.txt’ file has been added to the archive. If you want, you can also exclude the files that you don’t need. This can be done using the -x switch. In the above screenshot, you can see that ‘abc.7z’ file has been excluded from the new archive file. 7z also lets you password protect your archive file. This feature can be accessed using the -p switch. Note: The -mhe option enables or disables archive header encryption (default is off). The tool also lets you extract an archive file in the directory of your choice. This can be done using the -o switch. Needless to say, the switch only works when the command contains either the ‘e’ function letter or the ‘x’ function letter. And, as the value passed to the -o switch suggests, the aim is to extract the archive in the ./how/to/forge directory. In the above screenshot, you can see that all the contents of existing archive file has been extracted. But where? To check whether or not the archive file has been extracted in the ./how/to/forge directory or not, we can use the ‘ls -R’ command. In the above screenshot, we can see that all the contents of output.7z have indeed been extracted to ./how/to/forge. With the help of the 7z tool, you can create multiple volumes (smaller sub-archives) of your archive file. This is very useful when transferring large files over a network or in a USB. This feature can be accessed using the -v switch. The switch requires you to specify size of sub-archives. We can specify size of sub-archives in bytes (b), kilobytes (k), megabytes (m) and gigabytes (g). Let's understand this using an example. Please note that we will be using a new directory for performing operations on the -v switch. Now, to see the list of sub-archives that were created, use the ‘ls’ command. 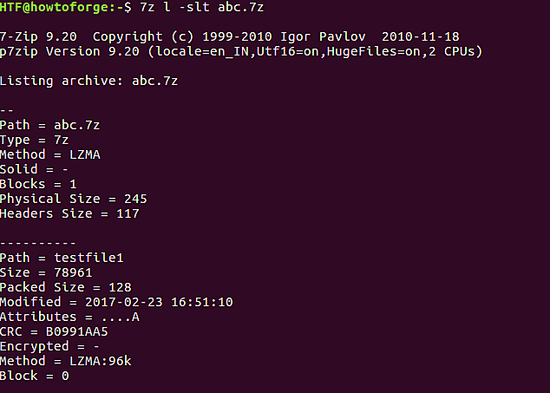 Note: You can extract files using the .7z.001 archive. But, for that, all the other sub-archive volumes should be present in the same directory. 7z also allows you to set compression levels of your archives. This feature can be accessed using the -m switch. There are various compression levels in 7z, such as -mx0, -mx1, -mx3, -mx5, -mx7 and -mx9. -mx0 = Don't compress at all - just copy the contents to archive. -mx1 = Consumes least time, but compression is low. -mx3 = Better than -mx1. -mx5 = This is default (compression is normal). Note: For more information on these compression levels, head here. For example, we have a bunch of files and folders in a directory, which we tried compressing using a different compression level each time. Just to give you an idea, here's the command used when the archive was created with compression level '0'. Similarly, other commands were executed. Here is the list of output archives (produced using the 'ls' command), with their names suggesting the compression level used in their creation, and the fifth column in the output revealing the effect of compression level on their size. If you want, 7z also lets you display technical information of an archive - it's type, physical size, header size, and so on - on the standard output. This feature can be accessed using the -slt switch. This switch only works with the ‘l’ function letter. If you want to create a non 7zip archive (which gets created by default), you can specify your choice using the -t switch. So, howtoforge.zip is indeed a ZIP file. Similarly, you can create other kind of archives that 7z supports. As you would agree, the knowledge of 7z 'function letters' along with 'switches' lets you make the most out of the tool. We aren't yet done with switches - there are some more that will be discussed in part 2. Is there a way to avoid this verbose information while extracting using 7zip? I did not find any "silent" command line option to 7z.exe.